My apologies for not posting in a couple of days. My family and I took a quick trip to Okinawa over the weekend, an interesting and emotional return for us as it was the place my daughter was born and she wanted to actually see the areas we used to live in and frequent. Despite the high humidity (I SO do not miss that) we had a great time and I’ll be sharing more about one of our sightseeing destinations on Wednesday. But for now, I wanted to review one last book in my collection before we pack up the bookshelf and everything on it in preparation for the move to Tokyo next month. It’s been a few months since I ordered A Geek in Japan but it’s taken me some time to get around to it. 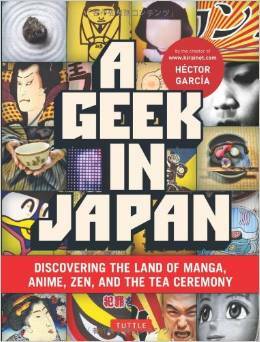 A Geek in Japan was written by longtime Japan resident and enthusiastic Japanophile Héctor Garcia. He also blogs at the incredibly popular site kirainet. Héctor has been in Tokyo since 2004 and he used the popularity of his blog as a springboard to write this book. And, despite its light weight, it’s a hefty tome. There are twelve chapters, covering such topics as “The Unique Japanese Character”, “Curiosities and Symbols”, “The World of Manga and Anime” and “Modern Japanese Music”. Within each chapter, many subtopics are covered. For example “Chapter 5: The Japanese at Work” delves into Japanese agriculture, the structure of Japanese companies, and even workplace manners. It’s clear that Héctor loves Japan and is quite knowledgeable about its culture and customs. He presents concepts that are not often elucidated in regular travel guides (such as honne/tatemae, giri, and wabi sabi) and he gives personal examples of how he encountered these aspects of Japanese culture during his time in Japan. While Hector’s expertise is assured, his presentation comes across more as a conversation with a friend, a friend who is really eager to share this amazing country with you. For me, his sections on anime, manga and Japanese music were incredibly helpful. Japan’s pop culture scene is not something that interests me greatly, and therefore is not something I know very well, but his presentation of the material was very readable and enjoyable even for a novice. But I also appreciated his descriptions of more elusive concepts like honne/tatemae (personal opinions versus societal obligations), which many travelers confront but may not ever have heard of or grasped. While I didn’t mind taking my time with this book (and you need to), some readers might find it too dense for their liking. The print is quite small and there is a lot of it on every page. The information is interspersed with helpful pictures and illustrations but there is still a lot to process. I also found the final sections (Chapter 11: Visiting Tokyo and Chapter 12: Traveling Around Japan) to be short on useful information compared to the rest of the book but you could always supplement what’s presented with an actual travel guide and blogs (like this one 🙂 ). This is a great book to have on your shelf. It might take you some time to read it cover to cover but it is an excellent resource to pick up when you have a question on specific aspects of Japanese culture.